1. Select the email message you want to flag. 2. Click the flag icon. 3. The flag turns red, and a Follow-up message appears in the header of the email message. Note: Follow Up flags are used for actionable items only. 1. Select View > To-Do Bar > Tasks. 2. 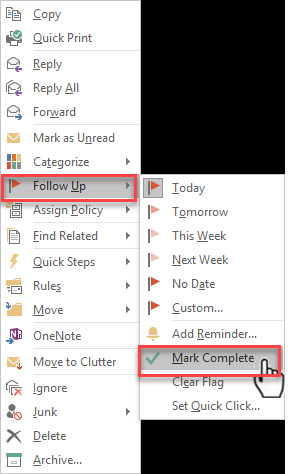 The To-Do Bar section will appear and will show all flagged messages. You can simply click on the red flag to mark it as complete, or you can do the following steps. 1. Right click on the message. 2. Select Follow Up > Mark Complete. The flag will change to a green checkmark.